Three years ago Colin Danly ’15 arrived on the College of William and Mary campus as a freshman knowing only his roommate. He returns to campus his final year as the President of the Student Assembly, and is eager to offer aid to new students. Taking advantage of tradition was a key piece of advice Danly shared. He explained that tradition is an integral part of the student experience at a school as old as the College. At times, there can appear to be a divide between freshmen and the upperclassmen community, Danly added. He said that he believes this divide quickly dissipates once freshmen start getting involved on campus. When it comes to getting involved, Danly emphasized the importance of the Student Activities Fair, planned for Aug. 26, the day before classes start. At the event, freshmen will have opportunities to learn about a variety of organizations directly from active students. Beyond the formal activities fair, Danly also advises freshmen to simply look out for clubs tabling around campus. He encourages them to not hesitate in talking to students about their organizations. “It’s always really cool for freshmen to go and talk to people who are so dedicated that they’re tabling and taking time out of their day to talk to students,” Danly said. Danly said that he recognizes the pressure freshmen feel to get involved on campus. He emphasized that new students should not feel the need to choose all their involvements during their first year. Another opportunity for freshmen to get involved in campus life is in the freshmen SA elections coming up Sept. 25. The first information session is Sept. 7. Danly recommends that any freshmen interested in running should take a chance and put themselves out there. He explained that freshmen are an important part of the SA as they offer fresh ideas and input. When it comes to campaigning, he advises freshmen candidates to remain genuine. In general, Danly said he wants freshmen to feel welcomed on campus. 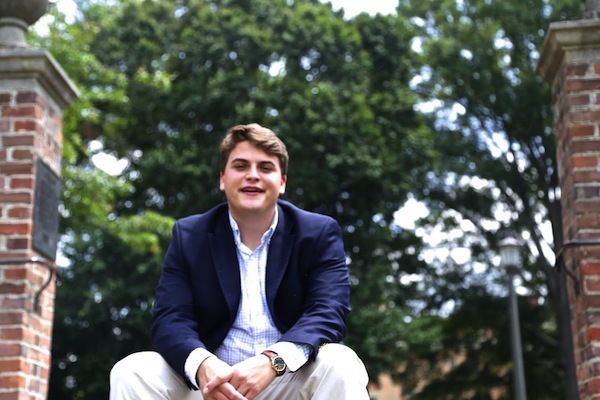 As Student Assembly President, he hopes to let new students know that he is here to make their College experience the best it can be. Danly acknowledged that many of the projects he has planned are long term and may not be finished in his one-year term. It will be up to his successors to continue these efforts. To all students at the College, Danly said he is accessible through email and Facebook, as well as in person. Madeline Bielski '17 is the Digital Media Editor from Middleton, WI majoring in International Relations. She previously served as Managing Editor, News Editor and Assoc. News Editor.